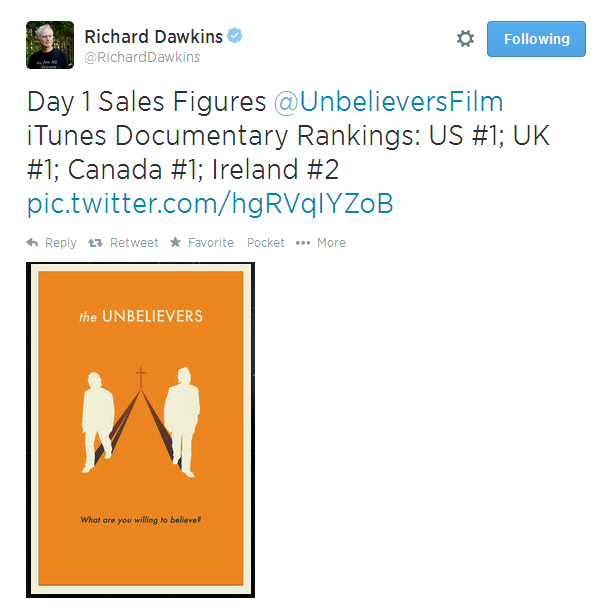 After a long wait, the anticipated documentary, The Unbelievers, is now available on iTunes, Amazon, etc. If you’re not familiar, it follows two scientists and well-known religious skeptics Richard Dawkins and Lawrence Krauss as they travel around the world debating apologists, delivering lectures, and having public conversations about science and reason in enormous concert halls (what makes me giddy is that these halls are all full). The best description of the style I’ve heard is a rock-documentary for scientists. The film is fast-paced, moving from hotel to hotel, city to city, event to event – and culminates during the 2012 Reason Rally in D.C., which turned out to be the largest secular gathering in recorded history (and was somehow completely ignored by the major media). You can see the trailer below. I rented the flick last night ($4.99 in the US on iTunes) and did really enjoy it, despite being – appropriately – skeptical. I read some initial reviews, like this one in the NY Times, that seemed to focus too much on what the reviewer wished the movie had been instead of what it was (if I recall correctly, John Updike had a rule about book reviewing where he would try to avoid doing just that, no doubt because he found it annoying when his own books were reviewed that way). In order to move at its breakneck speed, The Unbelievers assumes the viewer is already familiar with the standard arguments for and against religion, and so there are no prolonged or deep discussions of the issues. Maybe a bit more character or issue development would have been nice, but that wasn’t what this film was trying to do. And no, none of the “good” arguments for or proponents of religion are featured, but the movie only covers a short tour and I think was intended to simply be an accurate representation of that small slice of time. Richard did have a debate with the Archbishop of Sydney – supposedly a sophisticated theologian – during period the film covers, but it’s pretty clear in the film (and if you watch the full debate below) that he’s far from deserving of that adjective. Krauss has a similar touching scene in the movie, where before a debate with a Muslim apologist he retires to read “his Bible”, a paperback edition of Hitchens’ god is Not Great, saying a bit longingly that “Christopher always inspires me.” The two were good friends prior Christopher’s passing and you see immediately how much Krauss (and the entire secular movement) misses him. The film debuted at #1 in several outlets yesterday.